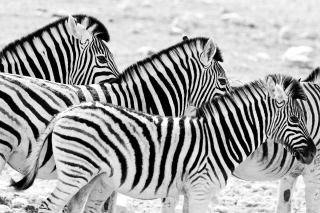 One of the joys of visiting Etosha National Park is the time spent gazing at the activity around the waterholes. After a while the drinking hierarchy amongst the animals becomes apparent, with the zebra, giraffe, wildebeest and various antelope happily drinking their full until the elephants turn up. Once the family groups of elephants come into view the other drinkers slowly move away and stand peacefully at a safe distance, showing due deference, until their time comes again.